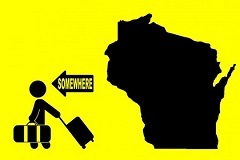 http://newiprogressive.com/images/stories/S5/wisc-leaving-s5.jpg False promises and overblown estimates of business expansion have been hallmarks of our Governor Scott Walker for years and now President Trump has taken that tune to new heights. Here is a fact check from a County Commissioner in our neighboring state, Minnesota. DAKOTA COUNTY, MN - I recently posted a comparison between Wisconsin with Minnesota, using only documented figures and rankings. A couple Iowa friends suggested both Minnesota and Wisconsin would pale in comparison to the Hawkeye State. So I checked. Below are the results. FORTUNE 500 COMPANIES. Minnesota is now home to 19 companies on the Fortune 500 list, up from past years, according to fortune.com/fortune500. Wisconsin is down to nine, having previously been home to 10; and Iowa is down to two, having previously been home to three. 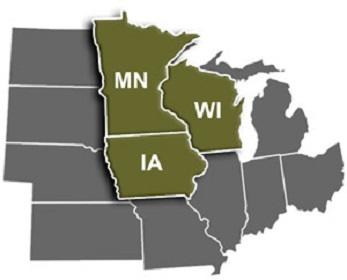 Notably, Minnesota is also home to the nation's largest privately-owned company: Cargill. In Dakota County, Mendota Heights-based Patterson Companies recently made the Fortune 500 list, joining CHS of Inver Grove Heights, which is in the Fortune 100 with over $31 billion in annual revenues. CHS, alone, is bigger than any company in Wisconsin or Iowa. DEBT. The State of Minnesota's debt equals $2,768 per resident, while the State of Wisconsin's debt equals $4,278 per resident. The State of Iowa’s debt is $1,821 per person. Source: cnbc.com/2018/07/10/americas-top-states-for-business-2018. Dakota County has zero debt, which is unusual in Minnesota and across the country. THE AXE. The Gophers beat Wisconsin 37-15 yesterday to bring Paul Bunyan's Axe back to Minnesota and even up the longest-running rivalry in Division I football history (FBS). The 128-game series is now tied 60-60-8. Oh, and Iowa beat somebody, too. With lots of family and friends in both Wisconsin and Iowa, I wish our neighbors to the east and south nothing but the best. Except when their teams play ours. Joe Atkins is a County Commissioner in Dakota County, Minnesota. None of the sources cited have been independently verified for accuracy.